Tips, techniques, core exercise review and a Total Gym work-along routine! The perfect way to get back into your Total Gym routine! 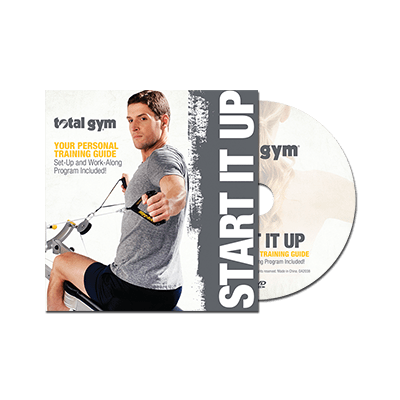 Get started on the right track with the Total Gym Start It Up program. Follow Rob Glick and Rosalie Brown as they guide you through set-up instructions, tips and techniques created to take all the guesswork out of using your Total Gym. Once you’re ready to start working out, sample some of the Total Gym core exercises or skip right to your very first Total Gym work-along program. Rob and Rosalie will introduce you to all the fundamentals of the Total Gym, guaranteed to start you on the right path to obtaining your fitness goals.